Something about the fall makes me introspective. Maybe it’s the grey days or the excuse to pull out my favorite tweed trousers again or the fact that I can feel the end of the year looming, but even here in Alabama where it’s hardly cool enough to feel like fall- I can see the leaves changing colors and I know that fall has arrived. Fall introspection takes different forms for different people, but for me it usually focuses on the blog. It’s a little terrifying to think the blog might be turning four in January. If it was a child, it would be in pre-school. 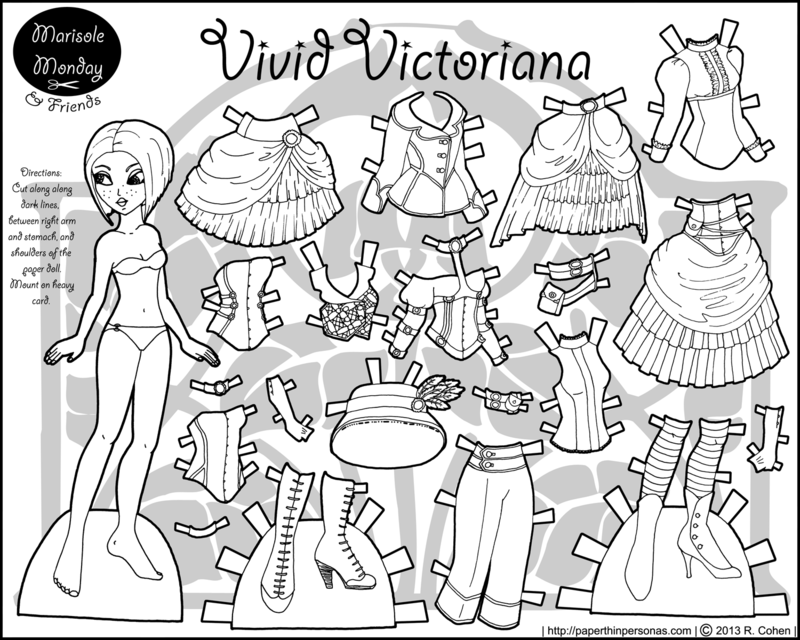 Meanwhile… here’s a new printable paper doll. And who doesn’t want that? Last week, we got to see today’s paper doll in black and white and here she is now in color. I wanted to go with a shabby chic color scheme and a break from the usual “Steampunk=Brown” mentality. 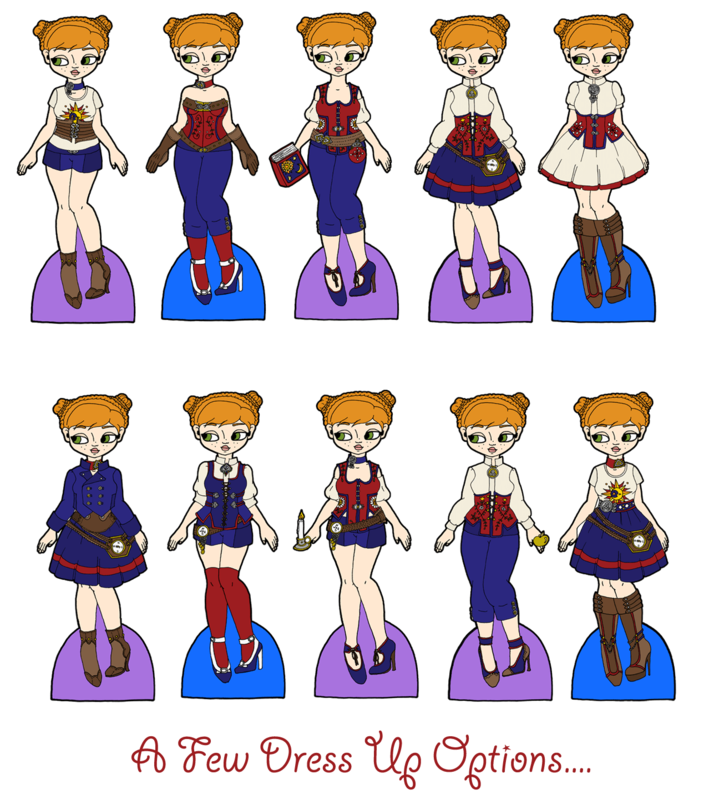 As I always say when I post a paper doll like this, I’m not really sure how one decides if something is steampunk. Never the less, I’m very pleased with how she came out. She’s a Margot paper doll, because I thought Margot needed some love. Thoughts on where the blog is? Where the blog is going? How it should get there? Please let me know. I know I don’t always respond to comments as quickly as I would like, but I do read every one and I love getting them. Well… I can say what this isn’t pretty quickly. This isn’t a Halloween printable paper doll. I wanted it to be, but sometimes life doesn’t cooperate. Instead of a Halloween printable paper doll and her clothes, we’ve got a steampunk inspired neo-victorian Margot paper doll and her clothes. I think the paper doll is just as nice as something more themeatic, but it always seems to me like I should try to follow the seasons on the blog, even though I rarely succeed. This year nothing really Halloween oriented has happened on the blog. I do hope to get a vampire Pixie paper doll I drew an embarrassingly long time ago finally finished and posted, but the truth is that September was such an insane month for me (wedding & flooded apartment) that I didn’t get any of my Halloween plans finished. However, if you want a Halloween Marisole Monday & Friends paper doll, I have done several.. I did a vampire one year, a Gothic Mia paper doll, and then a Marisole with costumes. 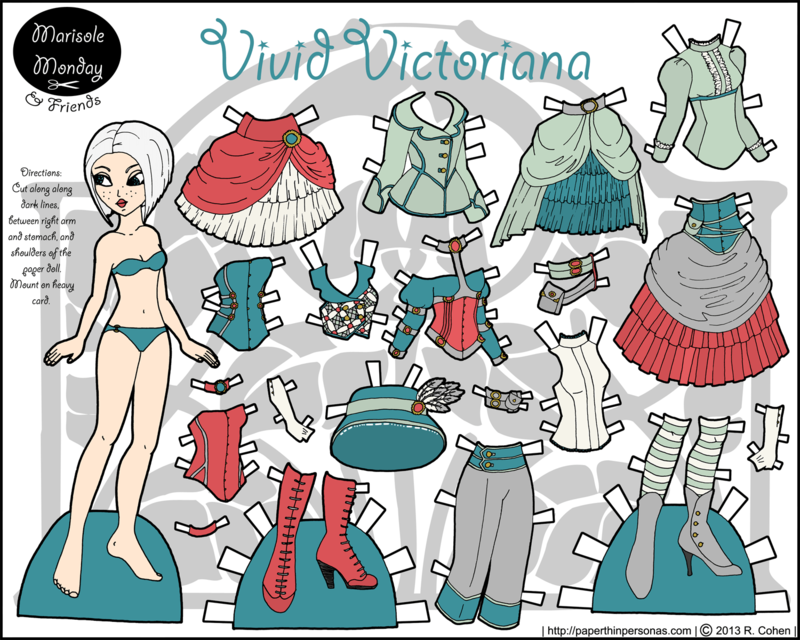 Last year, I teamed up with Liana, Toria and Boots and we created a collaborative paper doll and clothes. That paper doll collaboration was so much fun that I keep telling myself I’ll get up the energy to organize another one. I just haven’t seemed to have the time. Hmm… this post got a bit more whiny than it started. I do apologize. Still… part of me is kicking myself for not finishing the flower fairy paper doll I was working on. I’ve had a lot of requests for that and I wanted to have it done for Halloween. And you might have noticed a new format with this post. It’s something I’m trying out, because I was feeling like the posts on the first page of the blog were all getting a little bit too long. I’m not sure I am going to stick with it. As always, I’d love to hear what you think. Speaking of what people think… there’s a new poll in the sidebar. Snow-White and Rose-Red (Schneeweißchen und Rosenrot) is a German fairy tale collected by the Brother’s Grimm. It’s not the same as Snow White (Schneewittchen), though a lot of comics and stories do connect the two, like Fables (which is wonderful, by the way, if you like comics). I know Snow White and Rose Red is not the most well known story, but basically it’s your standard girls meet bear, girls meet evil dwarf, girls cut off evil dwarf’s beard, bear kills dwarf, bear becomes prince sort of affair. The moral of the story probably has something to do with being nice to bears and/or dwarfs, but that all seems rather unimportant. I decided to draw a new Flock doll to go along with Dove for this story, so everyone can meet Swan. Swan, here with blond hair in ringlet curls, is the latest member of the Flock family and the second Asian doll (or at least my attempt at it). I was going to do a fairytale from the Asian continent, but I don’t know much about Asian fairy tales (and even sticking and entire continent’s culture into one block is totally painful to me, but I digress). Before someone suggests Mulan, I should say that Mulan is not, technically, a fairy tale, but rather it is a legend. Fairy tales, generally, are defined by folklorists as containing magic, mystical creatures and generally not being perceived by the tellers as being true. In other words, no one ever through Rose-Red and Snow-White actually happened. Legends, generally, at some point in their history, were perceived to be true. King Arthur and the Holy Grail is a legend. Anyway, enjoy Snow White and Rose Red. I certainly had fun drawing them. So, in celebration of the 4th of July, here in the United States, I offer a paper doll, as usual. I mean, I don’t know how else I was going to celebrate. I’ve done some 4th of July paper dolls in the past… like these Marisole Monday rocking some 18th century attire which I had a lot of fun drawing. At home, in Alaska, they have fireworks at midnight on the 3rd of July, because it doesn’t get dark until about 10 pm. In Alabama, where I live currently, I have no idea what they do, but I can hear the fireworks from my apartment. I had a quiet 4th which, after two weeks of constant travel and stress, was just what I wanted. This is a new member of the Mini-Maiden Family. I am thinking of naming her something that begins with H, but I am having trouble coming up with an idea. There aren’t a lot of good H names out there… So, at the moment I am divided between Helen or Hannah… neither of which I’m too smitten with. Suggestions from the audience? Among my various hobbies, other than drawing paper dolls, I mean, I play table top rpgs. One of my favorites is Shadowrun which I play on Saturday nights, usually. Inevitably, a bout of Shadowrun playing leads to be drawing cyberpunk inspired paper doll sets. While I agree with the general complaint that Shadowrun isn’t very pure cyberpunk, it is still a lot of fun, plus in how many other games can you have elves with assault rifles? I openly confess I have some reservations about the portrayal of Native American’s in the cannon of the game world, but no more of a problem than I have with how women are portrayed in almost every game book ever, so I can get over it. By the way, I updated the Showcase recently and forgot to mention it. My bad. So, there’s some new work in there by Meredith and I have more to add, I just haven’t gotten the files re-sized yet. It will happen soon enough. Thank you, Meredith for participating. The other thing I wanted to mention is that the blog will be going into hiatus for the month of June. I have travel, work obligations and I’m going to be presenting a paper at an academic conference, all of which leaves me terrified and really busy. I’ll still be checking my email and answering comments when I can, but I won’t be updating. I’ll give a longer announcement about it when we get closer to the date in question. So, I was asked where the name Flock came from. Basically, I wanted a name that would allow for each of the paper dolls to have a unique name, but wouldn’t force me into a specific culture or letter of the alphabet. The idea was that since so many girl’s names were based on birds like Robin or Raven or Oriel, than it wasn’t a far reach to suggest names like Dove or Swan. In many ways, the names of the Flock are intended to be place holders, so that someone could name the dolls anything they wanted and they give me a way of talking about them and keeping tack of them in my head. Today, Wren is being Little Red Riding Hood (and I am not apologizing for the pun) and she’s pretty cute. The color palette is not the same as Rapunzel, but it’s the same family of colors, so the two dolls can share some pieces of clothing I think that’s important, since the fun of paper dolls is dressing them up. There are two other Fairy Tale sets in the works, one for Rose Red and Snow White and the other for East of the Sun, West of the Moon. I don’t know which one will be done first. I’d like to also do Morgiana from Ali Baba and the Forty Thieves, but I haven’t even got it drawn yet, so I recommend people don’t hold their breaths on that one. Despite my small set of examples, there are actually 136 outfit combinations here, I just didn’t have time to play as much as I wanted. 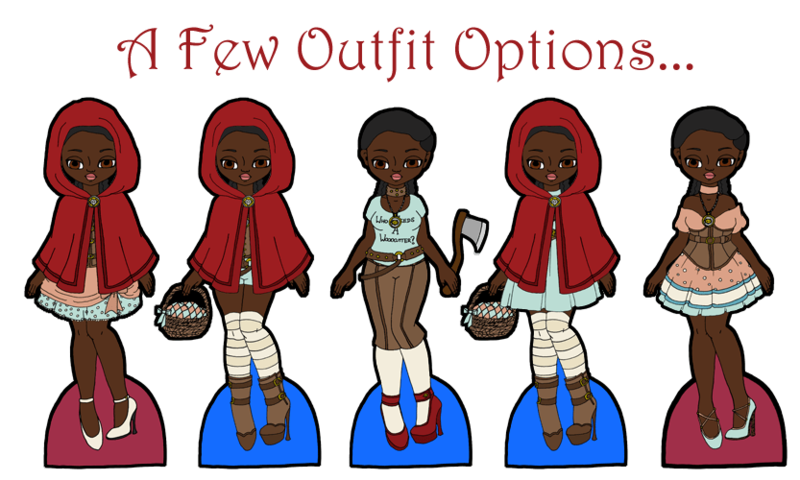 Sometimes life is like that… Oh well… Enjoy Little Wren Riding Hood.